(CNN) - Friday's jobs report showing an uptick in the nation's unemployment rate offered presumptive Republican presidential nominee Mitt Romney an opportunity to blast President Barack Obama for his economic policies, though the unexpectedly high number of jobs created in July gave Democrats a shield against GOP critics. With three monthly jobs reports remaining until November's general election, Romney sought to capitalize on the rising unemployment rate, writing the jump from 8.2% to 8.3% was a "hammer blow to struggling middle-class families." "My plan will turn things around and bring the economy roaring back, with twelve million new jobs created by the end of my first term," Romney promised in a statement sent shortly after the July jobs report was released. Both Obama and Romney have events scheduled for 11:45 a.m. ET, where each candidate will likely address Friday's jobs numbers. Capitalizing on a remark the president made in June, Romney wrote that Obama "doesn't have a plan and believes that the private sector is 'doing fine.'" Obama made that statement at a White House press conference, arguing the private sector was doing better than the public sector. He clarified the remark later in the day after heavy criticism from those on the other side of the political aisle. "It is absolutely clear that the economy is not doing fine," Obama said. Friday's job report showed the public sector continues to be a drag on overall hiring. The government cut 9,000 jobs in the month, while private businesses added 172,000 jobs. In his one-paragraph statement, Romney used the term "middle class" three times, pushing forward a campaign theme he began Thursday with the roll-out of a five-point plan designed to bolster the middle class. 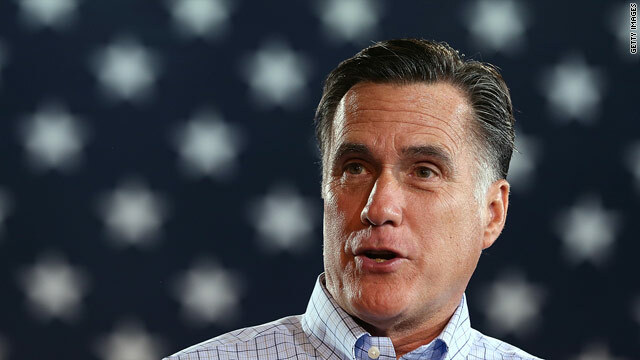 Romney's team said they would hold 24 "Strengthening the Middle Class" events Thursday and Friday in battleground states meant to educate voters about the presumptive GOP nominee's economic plan. Ben LaBolt, Obama's campaign press secretary, shifted focus away from the rising unemployment rate and toward the job creation numbers in Friday's report. The economy added 163,000 jobs in July, according to the Labor Department. "There have now been 29 months of consecutive private sector job growth and we could do more today to create jobs if Mitt Romney and Republicans in Congress stopped obstructing the President's jobs plan to create one million jobs now and took immediate action to ensure taxes on middle class families don't go up," LaBolt wrote. Voters consistently say in polls that the economy is the most important issue to them in the presidential election, making each successive monthly jobs report critical to each candidate's political fortunes. In a USA Today/Gallup survey taken July 19-22, 50% of voters nationwide said Romney would be better at creating jobs, compared to 44% who named Obama. In the seven states CNN considers "toss ups" in November's vote, the unemployment rate varies. June figures showed four battlegrounds - Virginia, Ohio, New Hampshire, and Iowa - with jobless rates below the national average. Florida and Nevada both had rates above the U.S. average, and Colorado's rate of 8.2% was on par with the national rate. July unemployment rates for individual states will be released later in August. In his statement reacting to Friday's news, House Speaker John Boehner similarly used Obama's "doing fine" remark, writing the rise in unemployment made it clear that the opposite was true of the economy. "Any new job creation is welcome news - but with unemployment still above eight percent and rising, and millions of Americans looking for work, it is insane to raise taxes on small businesses, as the president and his allies in the Democratic-controlled Senate propose," Boehner wrote. Alan B. Krueger, the chairman of the president's Council of Economic Advisers, wrote that the jobs report was an indication the economy was in recovery, while still pinpointing the start of the economic crisis to before Obama took office. Like Romney, he utilized the phrase "middle class" three times in the first paragraph of his statement. "While there is more work that remains to be done, today's employment report provides further evidence that the U.S. economy is continuing to recover from the worst downturn since the Great Depression," Krueger wrote. "It is critical that we continue the policies that build an economy that works for the middle class as we dig our way out of the deep hole that was caused by the severe recession that began in December 2007." In a line he has used for the past several months in reacting to jobs reports, Krueger wrote it was "important not to read too much into any one monthly report and it is informative to consider each report in the context of other data that are becoming available." Reince Priebus, the chairman of the Republican National Committee, said Friday the report was an indication that Obama's economic plan "didn't work at all." "Instead of supporting American innovation and job creation, he has squandered taxpayer money on failed companies like Solyndra, which led to job losses," Priebus wrote. "It's no wonder we can't end this economic nightmare. The president continues to take us in the wrong direction." Priebus also used Friday's report to back the jobs plan from presumptive GOP nominee Mitt Romney. "President Obama's only plans for a second term are higher taxes and more spending–exactly the opposite of what we need," Priebus wrote. "On Day One of his presidency, Mitt Romney will get to work implementing his comprehensive jobs plan to turn around the economy." Romney's an idiot! Any economist knows that as the job market improves, more people will become optimistic and again look for a job, thereby temporarily increasing the unemployment rate. The unemployment rate only counts people who are actively looking for work. The news of the day is that 163,000 jobs were created in July! Exactly how will rMoney create 250,000 jobs every month by raising taxes on the middle class and lowering taxes on the rich? IT. CAN'T. BE. DONE. *facepalm* oh wait! We can all take our Dressage horses and Limo elevators as tax deductions! And, we can move our savings to the Cayman Islands and Switzerland! Why didn't I think of that before? "My plan will turn things around and bring the economy roaring back, with twelve million new jobs created by the end of my first term,"
If mitts will draw a legal, binding contract that if he does not create 12 million new jobs, IN THE USA, by the end of his first term, then he will give up his entire fortune, including trust funds for the boys, hundred million dollar IRA, off shore accounts, Ann's horse and any accounts he has put in her name for some devious reason, etc., then I promise to vote for him. He lied to get in the Governors race in Massachusetts; he is lying now. When it comes to job creation, I do not have much confidence that Matt Romney a faithful member of The Church of Jesus Christ of Latter Day Saints (LDS) – The Mormons, is capable of creating jobs for anyone but other LDS faithful members. They are such a tightly knitted and very commited group to one another. A common pattern of a Mormon once in a management position is to hire only other LDS faithful Mormons. The LDS church officials believe in it so strongly, they sent the LDS faithful Utah lawmakers lead by Utah Senator Orin Hatch and other LDS faithful lawmakers to Washington to pass federal regulations making the LDS church exempt from hiring Non-Mormons. Who is looking out for you? I really do not think it will be Mitt Romney. Oh! It would be very interesting to learn how many jobs created in Utah with the massive amounts of Obama's Infrastructure Stimulus Money (many projects that were completed 5yrs ahead of schedule) actually went to non-LDS faithful companies or employees. "My GOP destroyed the US economy". Who said that? It was David Stockman – Ronald Reagan's director of the Office of Management and Budget. Those are his exact words as he wrote them in a New York Times op-ed piece. "On Day One of his presidency, Mitt Romney will get to work implementing his comprehensive jobs plan to turn around the economy." So let me see if I get this right...Mitt Romney said he would create 8 million jobs by end of his first term? Really? You couldn't even create jobs in MA which is just 1 state but all of a sudden you want the American people to actually believe you could create 8 million jobs in 50 states? Well, do you know my grandfather was Einstein? Really, he was! Please save me the laughter. Businesses pay record low taxes at the moment and that doesn't work. How will reducing taxes even further fair better? They ( the republicans ) are so out of touch. The recession happened because of republican policies. If we had done what they wanted , we would be in a Depression right now with far more unemployed ( no car industry & banking in a shambles ). The job outlook would be far worse under them & we'll find that out firsthand if they win in Nov. This Debt they keep blaming Obama for was largely created by bush not Obama. Our debt is only going to get worse under them. The rich will get richer & the poor will get poorer , because the repubs have never done anything to benefit the Country as a whole , if they could , they would get rid of Social Security & Medicare so they can give more money to the rich. WE need Universal Healthcare in this Country & High Speed Rail To stay in the 21st Century.